Austere, severe James Knox Polk served his Presidency of the United States from 1845 - 1849. Often referred to as the first "dark horse" President, James K. Polk was the last of the Jacksonians to sit in the White House, and the last strong President until the Civil War. He is considered responsible for extended the boundaries of the United States to the Pacific Ocean. Born in North Carolina in 1795, the oldest of ten children, Polk suffered from poor health. During these early years, his education was informal until 1813 when he enrolled in a Presbyterian school in Columbia. Polk was studious and industrious, graduating with honors in 1818 from the University of North Carolina. From Nashville: As a young lawyer he entered politics, served in the Tennessee legislature from 1823 until 1825 , and became a friend of Andrew Jackson. In 1824, he married Sarah Childress, whom he had met in school before attending the University of North Carolina. In the House of Representatives, Polk was a chief lieutenant of Jackson. He served as Speaker between 1835 and 1839, leaving to become Governor of Tennessee. Rising up: Polk was a leading contender for the Democratic nomination for Vice President in 1844. Both Martin Van Buren, who had been expected to win the Democratic nomination for President, and Henry Clay, who was to be the Whig nominee, attempted to take the expansionist issue out of the campaign by declaring themselves opposed to the annexation of Texas. Polk, however, publicly asserted that Texas should be "re-annexed" and all of Oregon "re-occupied." He's just the man we need: The belief that the United States should span the continent from the Atlantic to the Pacific Oceans, a.k.a. "Manifest Destiny", spurred great political debate. Andrew Jackson, correctly sensing that the people favored expansion, urged the choice of a candidate committed to the Nation's Manifest Destiny. Polk endorsed both the annexation of Texas and American control of the entire Oregon Territory. Polk also promised if elected not to seek a second term. At the Democratic Convention, Polk was nominated on the ninth ballot. Polk was the only candidate who stood for expansion. He linked the Texas issue, popular in the South, with the Oregon question, attractive to the North. Polk also favored acquiring California. Made the English Sell the Oregon Territory: In his stand on Oregon, the President seemed to be risking war with Great Britain also. The 1844 Democratic platform claimed the entire Oregon area, from the California boundary northward to a latitude of 54'40', the southern boundary of Russian Alaska. Extremists proclaimed "Fifty-four forty or fight," but Polk, aware of diplomatic realities, knew that no course short of war was likely to get all of Oregon. Happily, neither he nor the British wanted a war. Annex the land the Mexicans command: Acquisition of California proved far more difficult. Polk sent an envoy to offer Mexico up to $20,000,000, plus settlement of damage claims owed to Americans, in return for California and the New Mexico country. Since no Mexican leader could cede half his country and still stay in power, Polk's envoy was not received. To bring pressure, Polk sent Gen. Zachary Taylor to the disputed area on the Rio Grande. Seized the whole Southwest from Mexico: To Mexican troops this was aggression, and they attacked Taylor's forces. Congress declared war and, despite much Northern opposition, supported the military operations. Some legislators, including Representative Abraham Lincoln, felt that the Mexican War would be used as a tool to spread slavery into new states and territories in the west. After the famous stand at the Alamo and many American victories, the combatants signed the Treaty of Guadalupe Hidalgo in 1848 ending the Mexican War. In 1848, Mexico ceded New Mexico and California in return for $15,000,000. 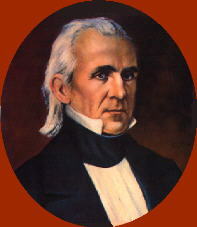 He sought no second term: President Polk added a vast area to the United States, but its acquisition precipitated a bitter quarrel between the North and the South over expansion of slavery. The states of Texas, Iowa, and Wisconsin were admitted to the Union during Polk's term of office. It was also under Polk's presidency that the United States Naval Academy in Annapolis, Maryland was established. Polk remained true to his campaign promise and did not seek a second term as president, retiring from office in 1849. Precious few have mourned: After the conclusion of his term in office, James Polk purchased a home, renamed Polk Place, in Nashville, Tennessee. The former president planned to retire there after a tour of the South. After traveling down the Atlantic seacoast and along the Gulf of Mexico, Polk returned to Nashville in ill health. He died in his home in Nashville on June 15, 1849, three months after departing the White House. The United States Postal Service create a James K. Polk stamp in 1995. If you are ever in Pineville, NC then you might want to vist the Polk Memorial. If you are ever in Columbia, TN you might want to visit the James K. Polk Ancestrial Home. Last Update Sunday, 20-Jun-2004 17:48:04 PDT.